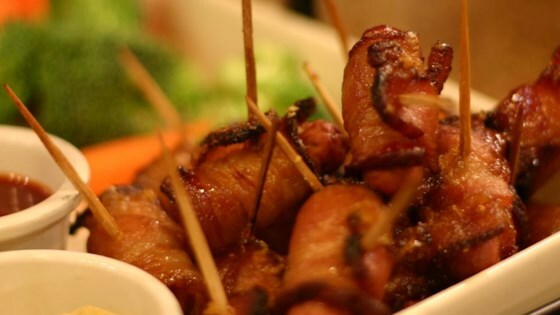 "Bacon-wrapped yummies! You can make these little smokies on skewers or toothpick them to secure." Featured in Allrecipes Magazine — Subscribe! Added to shopping list. Go to shopping list. Preheat oven to 350 degrees F (175 degrees C). Cut bacon into thirds and wrap each strip around a little sausage. Place the wrapped sausages on wooden skewers, several to a skewer. Arrange the skewers on a baking sheet and sprinkle them liberally with brown sugar. Bake until bacon is crisp and the brown sugar melted. Sweet indulgence on the go! Get a full year for $5! Cook 5-star weekday dinners every time. Reynolds® Aluminum foil can be used to keep food moist, cook it evenly, and make clean-up easier.